It's that time of year when we start thinking about Halloween cards. How stinkin' cute will these be on your Halloween cards and beyond?!? Sentiment was stamped and heat embossed. 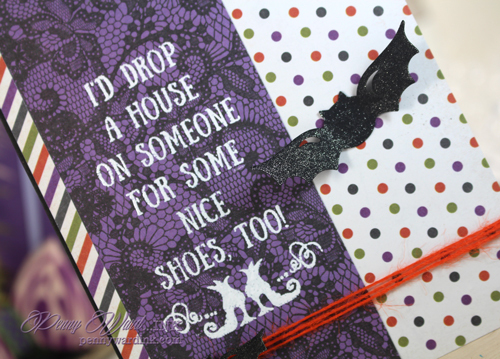 No Halloween card is complete without a bat or two cut with my Silhouette Cameo. Easy Peasy Mr. Sneezy card. I LOVE the variety of patterned papers - and the white sentiment on one of them. Such fun bats to top it all off. Thank you for playing along with us at Freshly Made Sketches. I LOVE the stamp set, and especially love how you showcased it in your design. The bats really are the icing on the cake. Thanks for joining us at Freshly Made Sketches!